The New York Times has a predictably insightful obituary on the life and work of this giant of a poet whose death this week was mourned the world over. What follows here is a brief excerpt from that talk. Anyone remotely interested or even merely curious about poetry/poets and poetics will find it fascinating. Click link above for the full text. Implicit in those lines is a view of poetry which I think is implicit in the few poems I have written that give me any right to speak: poetry as divination, poetry as revelation of the self to the self, as restoration of the culture to itself; poems as elements of continuity, with the aura and authenticity of archaeological finds, where the buried shard has an importance that is not diminished by the importance of the buried city; poetry as a dig, a dig for finds that end up being plants. * Preoccupations: Selected Prose, 1968-1978 (London: Faber & Faber, 1980), 41-60. As I say, I wrote it down years ago; yet perhaps I should say that I dug it up, because I have come to realize that it was laid down in me years before that even. The pen/spade analogy was the simple heart of the matter and that was simply a matter of almost proverbial common sense. As a child on the road to and from school, people used to ask you what class you were in and how many slaps you’d got that day and invariably they ended up with an exhortation to keep studying because ‘learning’s easy carried’ and ‘the pen’s lighter than the spade’. And the poem does no more than allow that bud of wisdom to exfoliate, although the significant point in this context is that at the time of writing I was not aware of the proverbial structure at the back of my mind. . . . 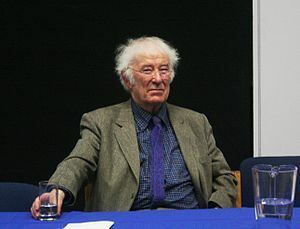 This entry was posted in Rants and tagged Literature, Nobel Prize, Poet, Poetry, Preoccupations: Selected Prose 1968-1978, Seamus Heaney, William Wordsworth. Bookmark the permalink. Thank you. Clearly we have similar interests!